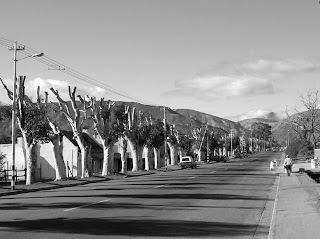 Our town’s impressive main road, Church Street, is lined with Eucalyptus gum trees, proud sentinels with their silver-grey trunks, firm and resolved against the onslaught of both time and man. They are the familiar sight welcoming the Prince Alberter home after a journey away. With their close ranking and wide girths they provide welcome shade to the townsfolk and buildings. They are a reminder of the generations which have gone before. One illustrious resident, George Garrett Rainier, planted these warriors around the 1880s, which means that their age is in the order of 120 years or more. His legacy includes persuading the local member of parliament at the time, Jan Luttig, that a pass should be constructed over the Swartberg. Other trees in the town are of significant heritage importance and should be protected - the rows of cypresses which are striking landmarks, each a unique sight achieved only through the passage of time and through the grace of God. Unfortunate though it may be, aging gumtrees are notoriously dangerous unless their growth is kept in check. They are once again being lopped mainly to protect property and the powerlines of the main street. In the recent past more than one property has borne the brunt of a fallen tree or branch. The sight of tree-felling always rouses mixed feelings in the community, no less with the current lopping programme. Five years ago a Tree Policy (boombeleid) was prepared by the Heritage Advisory Committee which recommended the phased replacement of the gumtrees with other suitable street trees which, given time, would become established to adorn the main street. However, a great deal of sentiment is bound up in these gumtrees, cultural icons of yesteryear, and the proposed strategy did not receive support from the local Council. Prince Alberters should use this opportunity to make their voices heard. Write to the Editor and put your point of view about the future of the gumtrees – should they remain until they die of old age, or should there be a phased programme of replacement?